Welcome to the "FEEL THE LOVE" Blog Hop (Saturday, February 5) hosted by Jaime at Glitter, Stamps and Paper Oh My. Jaime issued a challenge -- it's not just cards we're looking for this Valentine's Day, but other gifts "from the heart." So if the way to a man's heart is through his stomach, what better time to take out my Cricut Cake for its introductory spin?! That's right, Mr. Smiley (my DH John) bought me a Cricut Cake for my birthday last August, and it took until the dead of winter for me to take it out of its box. So many toys, so little time! 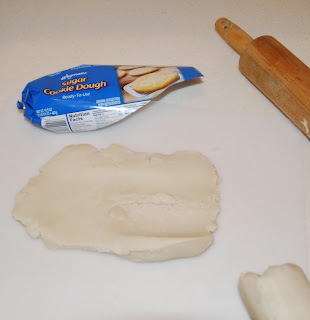 Here's a little suggestion: Roll your dough out right onto the cutting board. I only have one Cricut Cake mat and they're not widely available and they're expensive. 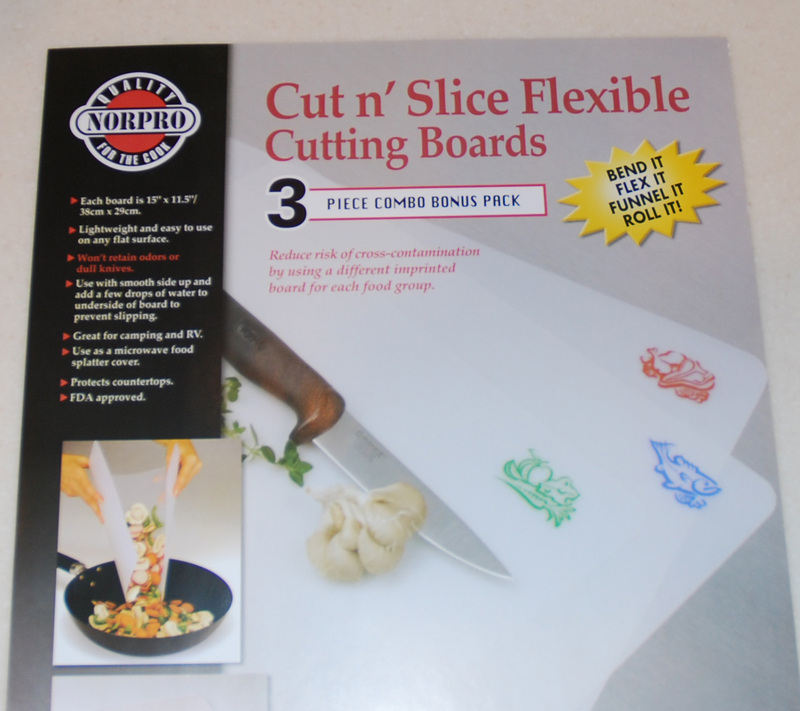 I found this alternative in my grocery store ... Cut 'n Slice Flexible Cutting Boards by Norpro. Three came in a pack for $7.99. They were approx. 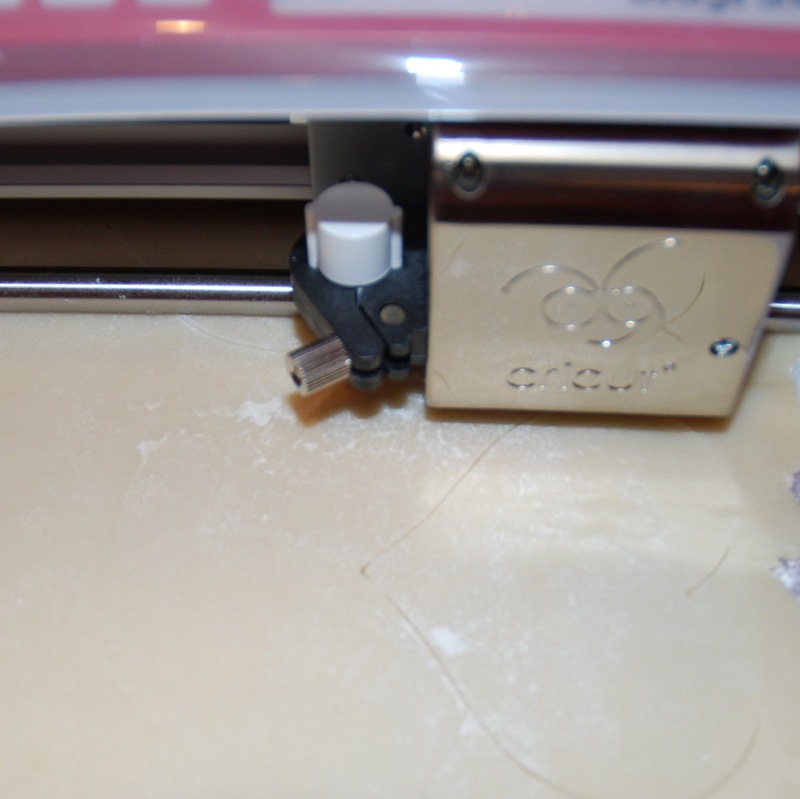 10"x14" so I just trimmed off 2" to make it fit under the rollers like the standard 12" mat. 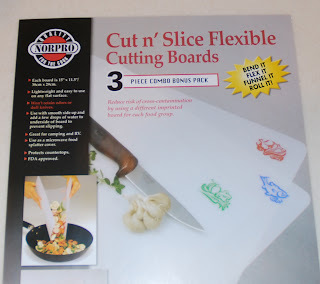 These are food safe and ready to use, and worked great -- did not cut through or peel/chip or anything. After rolling out your dough, I suggest chilling it to make it easier to cut (reducing drag). 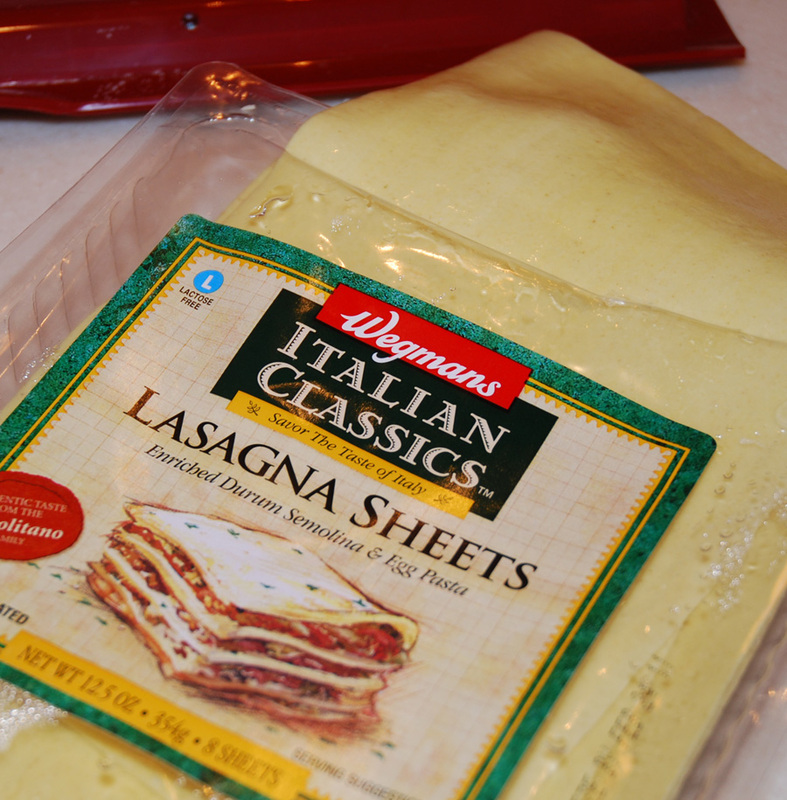 Slip the whole sheet in the freezer for about 10 minutes ... and cut! Slow to medium on your speed, and medium to medium high (4'ish) on your pressure ... 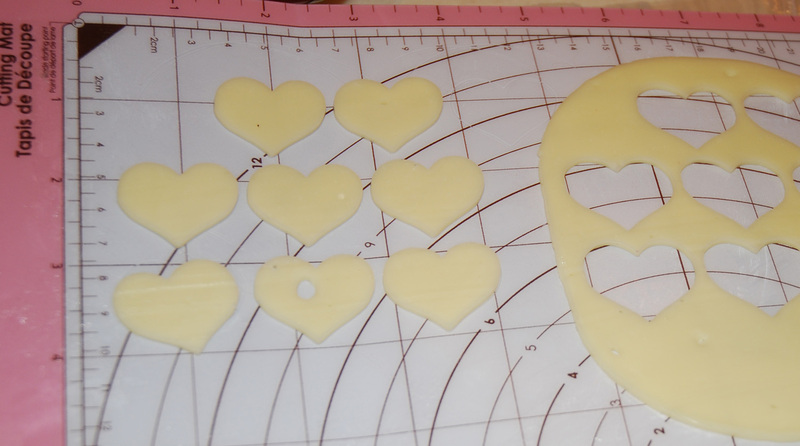 I cut the hearts out in a variety of sizes to see which I liked best. 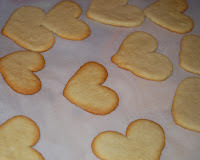 The cookies cut cleanly ~ 1" min. as well as larger. 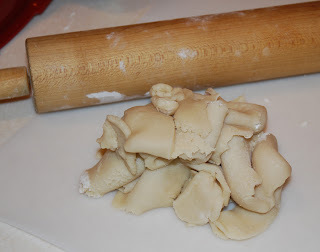 Smaller than 1" had increased drag resulting in an uneven cut of the dough. 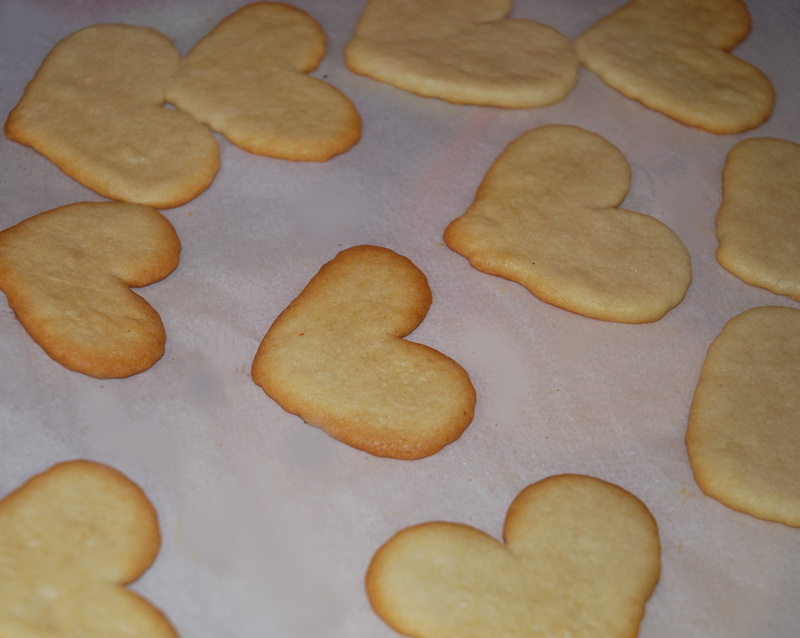 I laid the cookies out on a parchment-covered cookie sheet to bake. You can cut much more intricate shapes than just simple hearts. 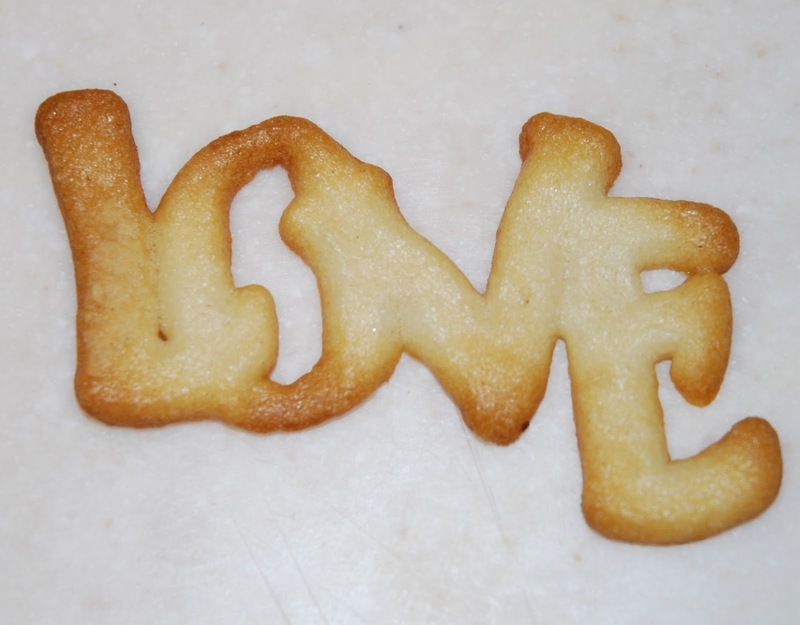 Here is a sweet image with a knock-out of the word LOVE. 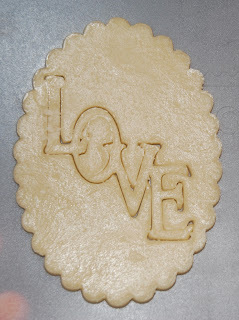 I made this cookie fairly large -- about 4" I believe, so the text would hold together as its own cookie. That cookie is shown at the top of this post. 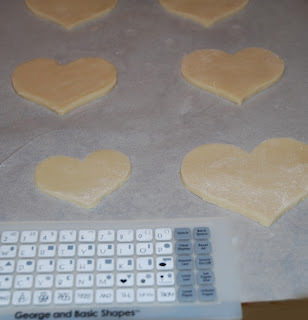 The nice thing about cutting cookies with the Cricut Cake instead of cookie cutters is the variety of sizes you can control ... and the uniformity of the cuts. 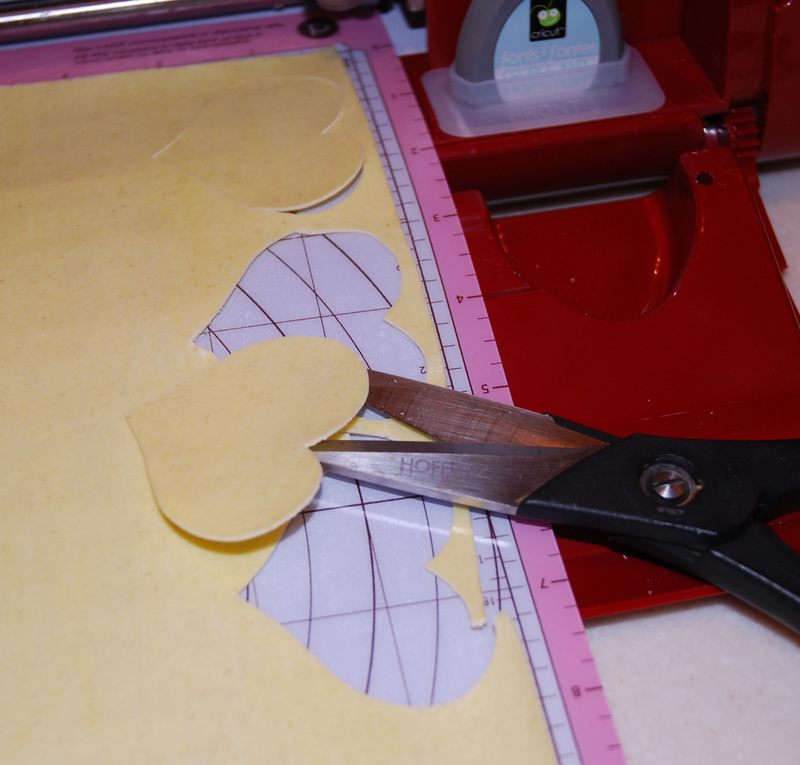 The OTHER nice thing about using dough instead of paper to cut with your Cricut is that you can re-roll your scraps and voila! Another fresh sheet to cut! Sure saves on having that drawer full of scrap paper, ehhh? Now ... on to more adventures with Cricut Cake. First thing first ... prepare the mat. To get your foods to stick (remember, these mats have no glue .. they're food safe! 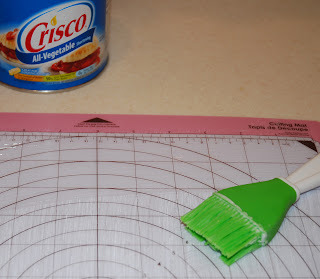 ), use a pastry brush to spread a thin clear layer of Crisco onto your Cricut Cake mat. Mostly, it cut very cleanly. However, every once in a while, the sheet shifted so there was a rough or uncut edge to the pasta. Kitchen scissors to the rescue! Again, these are food-safe and clean. Make sure yours are too, if you cut food with your scissors. I'm on a roll now ... turkey roll, to be precise! 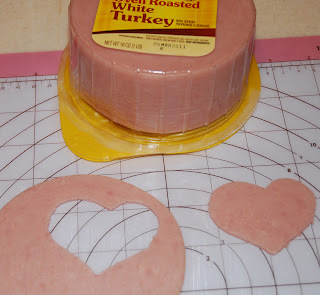 Let's see how deli meat is tackled by Cricut Cake. The meat stayed firmly to the shortening and was pretty easy to cut. It might be easier to freeze it to add firmness. I also tried cutting salami, but that was WAY too soft and was a cutting disaster ... even clogged my blade. So stick to firmer meats. Hard cheese was also very easy to cut. 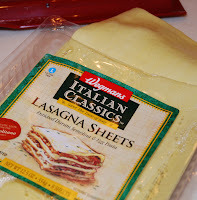 In this case, I used sliced deli provolone from a pre-cut package. I cut these hearts at 1". 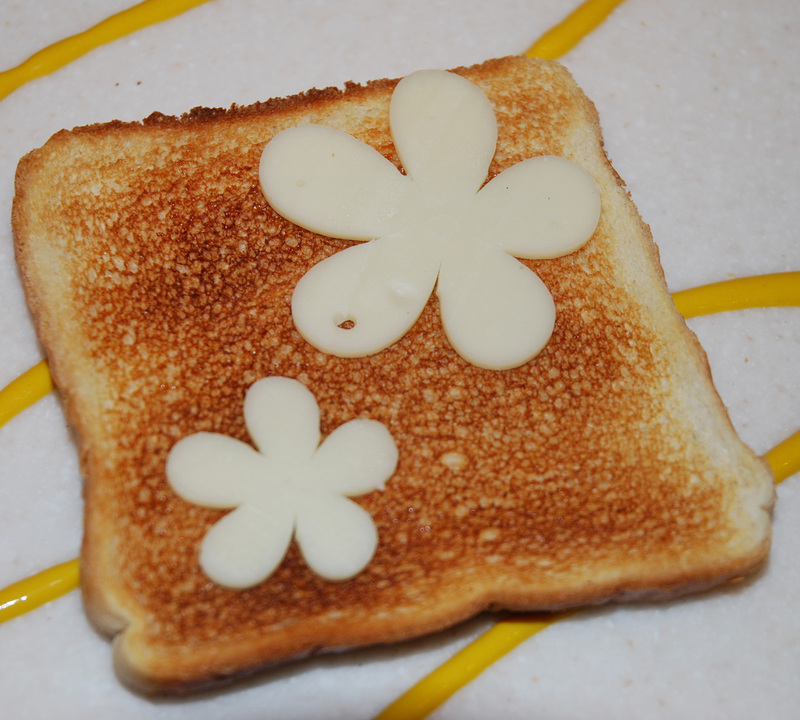 The little hole in the bottom center cut was a natural part of the cheese, unrelated to the cutting process. I could use both the cut hearts, as well as the off-cuts for a sandwich or a pretty topping for a meat pie? Can you imagine how much fun you could have making hors d'oeuvres for a special party? Use card symbols (heart, diamond, spade and club) for a bridge party ... a stork and baby symbols for a baby shower? 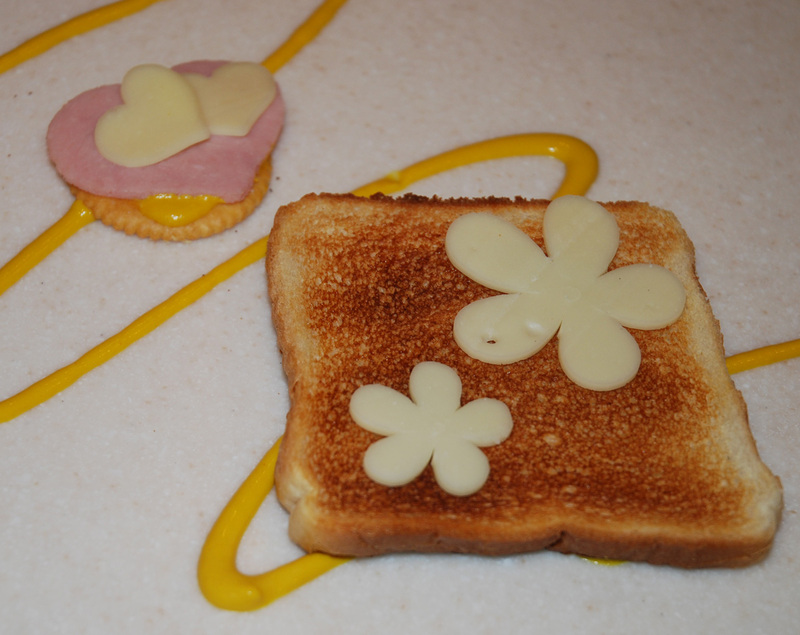 Whether on a cracker or toast or on top of a pizza, your deli cuts using your Cricut Cake expand the world where your creativity can have tons of fun! 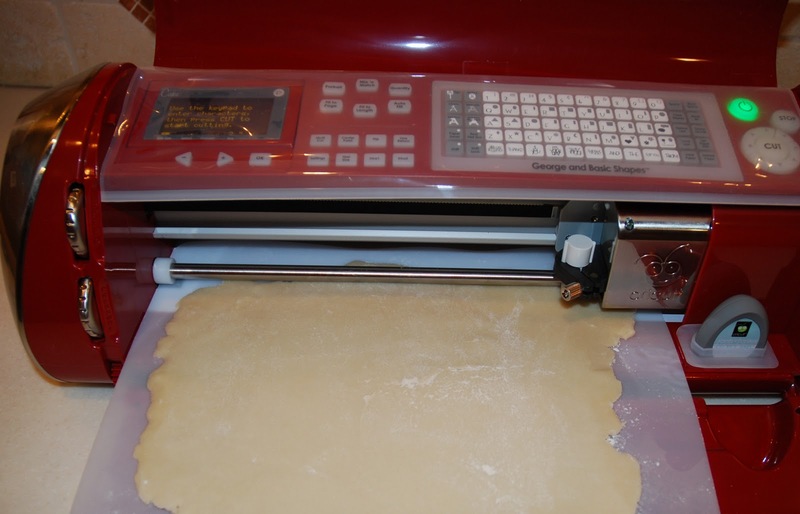 Of course, you can always use your Cricut Cake to use it conventionally -- that is, to cut fondant or gum paste to make cake, cookie or cupcake decorations. Here, I used pink fondant and cut heart shapes for Valentine's Day. 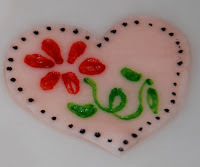 I then used food-dye color markers to decorate the fondant with a handpainted flower and dots. I plan to put this atop of some Royal Icing on the cookies. As much fun as I had exploring the different things to cut, here is my recommendation: If you're only interested in cutting a standard shape for which you have or can get a cookie cutter, use a cookie cutter, not your Cricut Cake. It is much faster especially when cutting cookies or deli meat. But if you want to have fun playing with your food (despite what your mother told you about starving children in Third World nations), Cricut Cake opens a whole new universe. And remember, DO NOT use your standard Cricut or a modified Cricut to cut any food product. That will void your warranty. 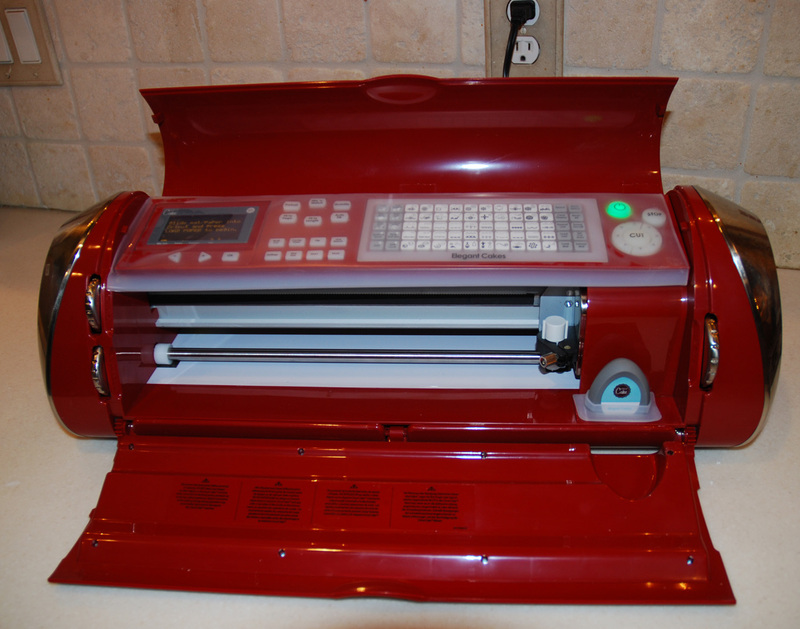 The Cricut Cake has been specially made with food-safe and washable features. For example, the blade housing is fully enclosed (no place for germies to enter) so when it gets gunked-up with salami you can wash and disinfect it. There is a piece of silicone over the keyboard, and a rubber housing to surround your cartridge, so no food products (flour, shortening) get stuck in the electronics. 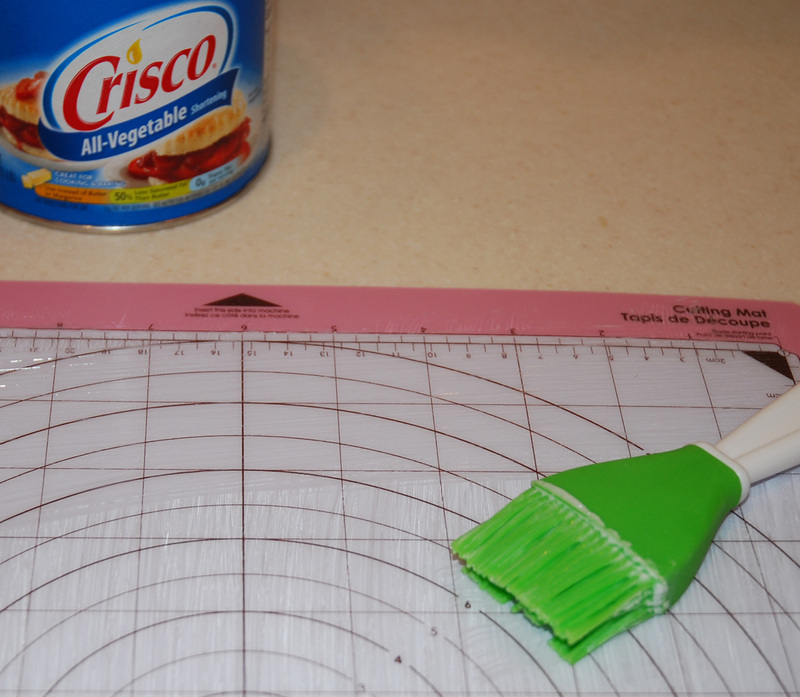 Yowzer, you could REALLY mess up a regular Cricut by cutting food. DON'T DO IT!! And one more thing: JUST THINK of all of the possibilities beyond food that you can cut if you can roll the medium out to about 1/4" thick. For example, somewhere down the road I'm going to try polymer clay and ceramic slip. I can then use polymer clay to make Christmas ornaments that dry on their own, or take my slip to my favorite ceramics shop for firing to make tile designs or accents to ceramic pieces I make like vases. Can you imagine how pretty some of the scroll-work or flower designs would be on the sides of vases??! BUT WAIT! Before you go, I have BLOG CANDY to reward you for slogging through this long post!! Here's what I have -- REAL CANDY! OK, and some paper stuff too. I've been making Valentine's Day candy and I will send you some CHOCOLATE for you to eat, or to pass along to your honey. 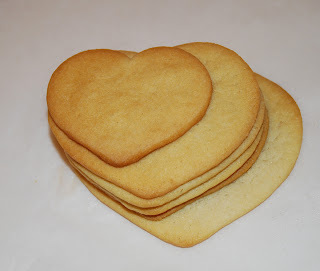 I'll also include some things to make your Valentine's sweeter. HOW TO WIN: Be or become a follower here, AND leave a comment. Mr. Smiley will choose a number randomly to pick the winner. Also, if you're in the mood to win more blog candy, it is not too late to post a comment to my next posting here on "Fairy Cut Fridays". All followers who comment on that post are entered into a monthly drawing to win a free copy of Fairy Cut Software (better than MTC or SCAL, in my opinion) ... a $99 value! And YES, you can use Fairy Cut to design or use any .jpg or image file, and cut using your Cricut Cake, too! OK ... moving right along ... Your next stop is Jessica and The Overjoyed Scrapper. 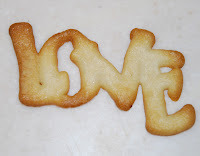 Click the name OR this ♥ to jump there. If you get lost along the way, be sure to hop on back to the start at Jaime's blog at www.glitterstampsandpaperohmy.com. i idint get it before. 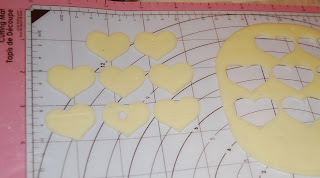 i had not idea that the cricut could cut more than just fondant! what a wonderful toy..humm now i want one. thanks for the insperation! Thanks for all the tips on the cricut cake. OH my Goodness you had so much fun with this and you are an enabler ROFLLLL you got me so now I want to go right out and get a Cricut Cake...LOL. I'll tell you I've wanted one for a while, but haven't had the cashflow ~ so it's on hold for a little longer. Thank you for so much inspiration. That looks like a great machine!! I would love to get one of those someday!! 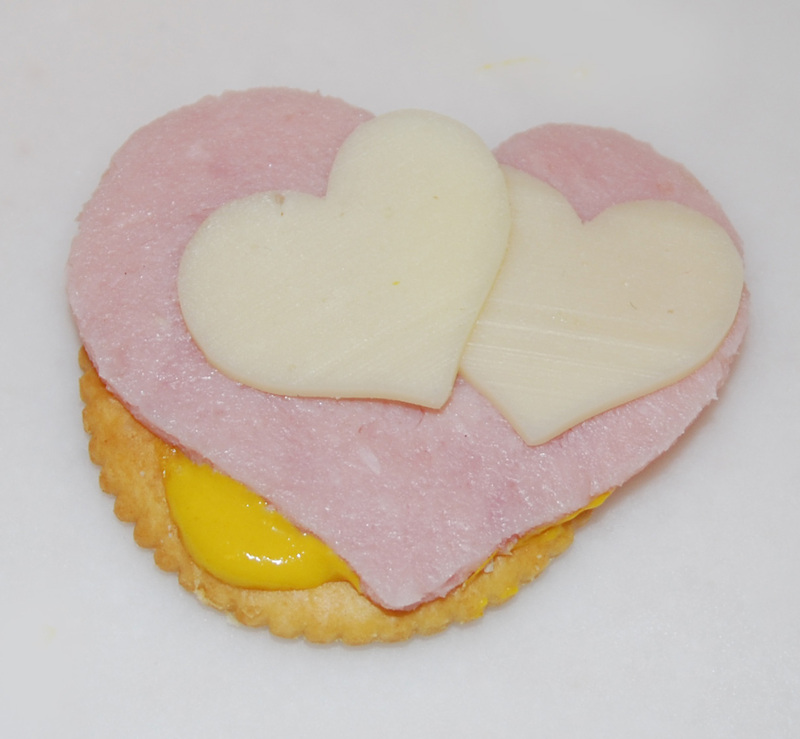 I love love love the turkey and cheese! How fun, this post makes me wish I had a few extra hundred dollars so I could go buy the cricut cake! WOW! that is so cool all the things you can do with the cricut cake. TFS! Wow, you put just about everything through that CC. I would have never thought of any of that. hi! i'm a new blogger and follower. check out my blog and follow me too. thank you! Thanks for the tutorial on the cricut cake.I am a follower. ~ Huh. I know I saw this post yesterday but why on earth didn't I comment then? You are just way too creative! I don't have a CC but even if I did I don't think I would ever think of the stuff you thought up! Very cool! ~ I'm already a Follower of your Blog! Oh my stars you are having way too much fun with this. 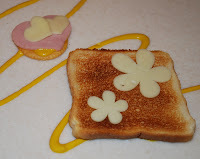 LOL Love all the creative things you are doing with food. YUMO!!! Too cute to eat (almost)I'm a follower. Wow! There is sooo much more you can do with the cricut cake... I never thought about it! THanks for sharing all of your fun ideas! pjritsema at gmail dot com. As a kid we always had heart shaped hamburgers and pink milk for valentines day... green for St Patricks day! You are so clever!!! And so many great ideas! Thanks for sharing! that is amazing!! great ideas! super cute! OK now this is too cool.. LOOK THE THAT CUT CHEESE!!!! LOL.. I simply love it.. oh and YES to some YUMMY candy!! Very cool, I keep thinking about getting one of these for my daughter. She does cakes all the time never would have thought for cheese, cookie doe and all the rest! I can't believe you thought of cutting all those things with the cake! too funny! Love what you did with the Cricut cake, no such things like that here in Mexico. 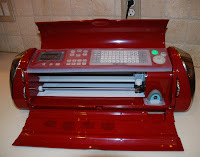 I do have a cricut that a dear freind bought for me as a gift and I use it every day!! I became a follow not to win but because I like your blog and your baby is adorable!! HAHAHA these are all so fabulous. I LOVE the sandwich it was so pretty, or was it because I'm so hungry lol AH either way super cute stuff. I truly enjoyed your explanations of the circut cake. I am going to share your blog with a friend who wants to purchase one. Thanks. Great ideas! Do you have a cartridge with a football? The meat and cheese would be PERFECT for the big game tomorrow! Love seeing what you did with your cricut cake. All the goodies made me hungry. Thanks for sharing. Very creative use of the Cricut Cake. I have not seen it used yet. You are so creative!!! 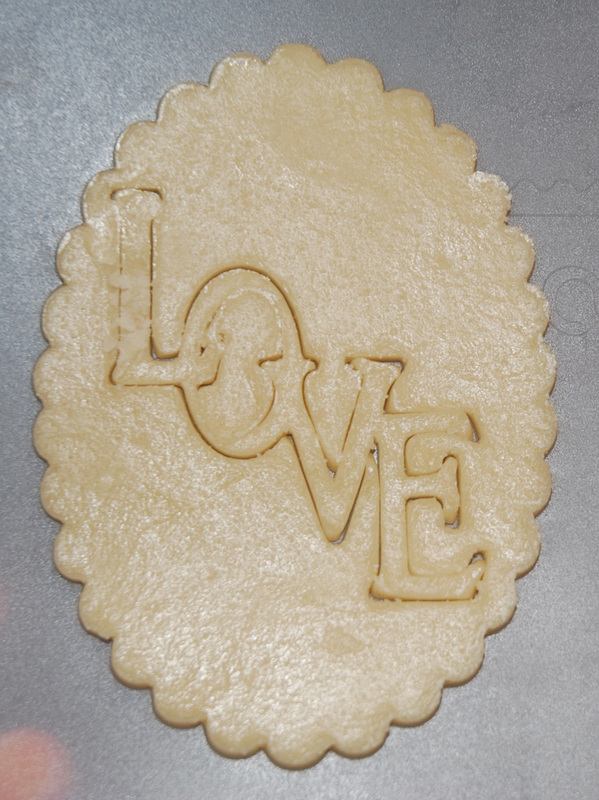 :) I love that you cut bologna and cheese & so many different things with your Cricut Cake! Are you serious about lending it out? If so, you are too incredibly generous!!!! Looks like you had some fun!! Love the turkey and cheese. You are so creative. I'm already a follower. I am a new follower! I love how you give such good instructions! Cute ideas using your cricut cake. I Love seeing all the fun you had with your Cricut cake! I have wanted one too! I only thought about cake decorating but you widened that thought! So cool. I have never seen the cricut cake used before and now I am seriously thinking of getting it. Thanks for sharing. Im a new follower- I have never seen a cake in action, who would have thought lunch meat? very cool.